The war in Libya is not only having an impact on Libyan nationals, but also on the 2.5 million migrants who have come there to work or live or are passing through to reach another destination. A Nigerian family seeking asylum sits on a cot in the living quarters they share with other asylum seekers in the reception center in Mineo, Sicily. "In Libya, we were treated like slaves"
Since the beginning of the war in Libya, more than one million1 civilians have fled the conflict, most of them crossing land borders to Tunisia, Egypt, Algeria, Chad, Niger, and Sudan. Others have crossed the Mediterranean Sea to Malta and Italy. Regardless of their nationality, or the original reason for their presence in Libya, these people are seeking refuge from a war. They are fleeing fighting and violence, and sometimes targeted abuses. They include men, women, children, and the elderly, and they are fleeing for their lives. These victims of war are seeking refuge wherever they can, hoping to find safety. As well as Libyans, there are people from Nigeria, Sudan, Somalia, Eritrea, Bangladesh, and at least 20 other countries. Those labeled 'third-country nationals' by international agencies are people who have already fled their countries of origin, escaping war, violence or poverty, in search of a way to survive. Many were already in an extremely precarious position when they traveled to Libya. This is the hidden story of the Libyan conflict. The war is having an impact not only on Libyan nationals, but also on the 2.5 million migrants2 who have come there to work or live or are passing through to reach another destination. With its open borders policy, Libya attracted workers from the Arab world, sub-Saharan Africa, and other developing countries for many years. Over the last decade, as the country became a major partner in the 'fight' against undocumented immigration to Europe, Libya adopted a more restrictive approach towards migration. The war in Libya is ongoing, with heavy bombing and shelling reported in recent weeks around Misrata and Tripoli. In Misrata, the frontline is just a few kilometers from the city center, while in the Western Mountains area, the frontline is moving north towards more populated areas. As a result, more Libyan citizens are fleeing their country, crossing the border between Tunisia and Libya. In some areas, populations remain trapped in the conflict zone in extremely difficult conditions. However, some 4,000 people—mainly sub-Saharan Africans—cannot or will not be repatriated for various reasons, including dangerous and difficult situations in their own countries of origin.5 In the meantime, 18,000 people have landed by boat on Italian shores since the conflict began, most having fled from the Tripoli area. Again, the majority of these are sub-Saharan Africans who risked their lives to cross the Mediterranean in overcrowded, unseaworthy boats. More than 1,800 men, women, and children never arrived, having drowned at sea when their boats sank. "I spent four months in prison in Libya. I was beaten every day. For three weeks I could not stand up. I still suffer from my injuries. I had to bury seven people, including three pregnant girls. If you did not do it, you were thrown alive in the hole along with the corpses." Following several calls6 to those states involved in the war in Libya to better receive, assist and protect its victims, Doctors Without Borders/Médecins Sans Frontières (MSF) wishes to bring attention to the current situation of the 20,0007 people who have fled the war and are now stranded in Shousha camp in Tunisia and in reception centers in Italy. These neglected victims of the conflict in Libya are now facing the consequences of poor reception conditions and insufficient protection in the countries where they have sought safety. Drawing on MSF’s experience of assisting these people in Tunisia and Italy, this briefing paper documents the terrible consequences of this situation on their health and on their lives, and points to the urgent and immediate need for more effective protection and a stronger humanitarian response. 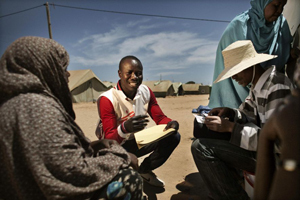 An MSF mental health worker talks to people living in Shousha camp. Since the start of the hostilities in February, MSF has provided emergency medical assistance free of charge to people affected by the conflict in Libya—in Benghazi, Misrata, Zintan, and Yefren—as well as to those who have fled to Tunisia—in Shousha camp, Ramada, Dehiba and Tataouine—and to Italy, in Lampedusa and Mineo, Sicily. Today, MSF is actively trying to gain access to the Tripoli region, where humanitarian needs remain mostly unanswered. In Shousha camp, located on the Tunisian-Libyan border, MSF teams provide primary healthcare and mental healthcare. Since early March, MSF has been running a mental health program for the many people who have either witnessed or directly experienced violence in the course of their escape from Libya. In addition, thousands of sub-Saharan African asylum seekers and refugees are survivors of persecution and ill-treatment that took place in Libya prior to the conflict, and some of them are suffering from severe mental health problems. On the Italian island of Lampedusa, MSF conducts medical screenings for people upon arrival, and ensures medical follow-up for those in the island’s detention centers. From February to June 2011, MSF assisted some 15,000 people in Lampedusa after they had fled the conflict in Libya. Almost 1,800 consultations were completed at landing points alone. "Since I arrived in Mineo, all I do is walk in circles. It’s like we're in jail here. For two months we've been told that we should get our papers soon, but nothing happens. Time is passing by and I don't even know how my family can feed themselves or survive without me. I can't stop thinking about them and it makes me really ill. Sometimes I am so worried that I can't eat." MSF also provides mental health support in a reception center for new arrivals in Mineo, Sicily, where some 2,000 asylum seekers of various nationalities have been transferred since March 2011. 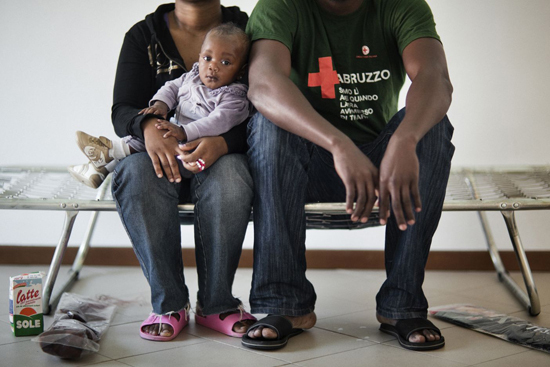 In reception and detention centers in mainland Italy, MSF closely monitors the living conditions and access to healthcare provided to refugees, asylum seekers, and migrants. In Italy and Tunisia, refugees and asylum seekers are now confined in camps and transit centers for an indefinite period of time, their freedom of movement severely limited. Existing transit facilities and services are not equipped for long-term stay, and confinement in these centers is tantamount to detention. This situation is having a serious impact on the mental and physical health of the most vulnerable people, including unaccompanied minors, children, pregnant women, and victims of torture, violence, or human trafficking. In both Tunisian and Italian centers, the existing accommodation is inadequate for anyone staying longer than a few days. For the most vulnerable, it is absolutely unlivable. Shousha camp is located in the middle of the desert, with inhabitants exposed to high temperatures and frequent sandstorms, making daily life extremely difficult. Hygiene remains a huge concern, as latrines and showers are insufficient and waste disposal is inadequate. There is no access to secondary healthcare in the camp, and referrals outside the camp are controlled by the Tunisian military health system. MSF is currently working to improve the referral system. Since late May, MSF teams have been providing primary healthcare to people in Shousha camp. A number of refugees have injuries, including fractures, gunshot, and stab wounds, resulting from the violent clashes that took place in the camp in May. Today, the most frequently occurring pathologies—diarrhea, skin diseases, and respiratory tract infections—are a direct result of the poor living conditions and overcrowding inside the camp. Chronic diseases such as diabetes and hypertension are also common. MSF is currently expanding its medical activities to better respond to the medical needs of the camp’s population. People living in Shousha camp queue for food. In several of the facilities visited, services are practically non-existent, with limited access to basic healthcare, no interpreters, no legal advice, no information, and no telephones available for those stranded there. Even pregnant women and people with medical conditions sleep on mattresses on the floor, and there is little separate accommodation for single women or families. "We are suffering here. The living conditions are difficult. We want to work, we want to live, and we want to move forward. But there is nothing here. We cannot go on and live by begging. This is what we do here – we queue to beg for food." With no consistent effort to provide separate accommodation for women and men, MSF has warned the authorities about the risk of sexual abuse in the Lampedusa centers. Unfortunately, this was confirmed by the first reported cases of sexual violence on June 18. MSF has already asked, on a number of occasions, for substantial measures to be taken to improve reception and living conditions for people fleeing Libya to Italy. Despite repeated meetings with the Italian authorities over the past two months, conditions in the Italian reception and transit centers have not improved—they have actually worsened as hundreds of people continue to flee Libya every day. Security has become an increasingly significant concern as the living conditions prove to be inadequate for long-term stay. In Shousha camp, a fire spread through the camp on the night of May 22, causing the deaths of four refugees and destroying 20 tents. This was followed by demonstrations and violent clashes inside the camp involving local residents. Six people died and dozens were wounded. MSF treated 35 cases of violent trauma and several refugees had to be admitted to hospital. Two hundred tents were also burnt down. "Every day is the same day in Mineo. We have no information; we don’t have anything that keeps us busy. I am wondering why I exist today. If I died, I don’t think anybody would cry. We are sleeping, waking up, eating three meals per day. We are okay. But we don’t know what's next. We are just here. My future will start again when I can think, I want to do this or this’. But for now I don’t know." In Shousha camp and in the reception center in Mineo, the process of determining who qualifies for refugee status is lengthy and not transparent due to a general lack of information. In Mineo, despite reasonable living conditions, there were riots on June 20 and 21 in protest of the Territorial Commission of Asylum only managing to process one application per day. The center houses 1,800 people, and most of whom are in a state of total desperation at the idea of spending years there. In Shousha camp, people have received appointments for refugee status determination interviews set for as far away as February 2012. As MSF’s medical and mental health activities have expanded in the region, MSF teams have heard many patients telling the stories of their migration journeys. Most had to cross the Sahara desert in extreme conditions, with no belongings and very little food and water. Some had already been victims of violence in their home countries; others witnessed the deaths of those who did not manage to reach Libya. For some, life in Libya before the war was horrendous. The majority of those who seek psychological consultations in Shousha camp were imprisoned in Libya before the war, for being undocumented or for having been sent back when they tried to reach Europe.10 In Libyan jails and detention centers, they report inhumane treatment, degrading conditions, violence, extortion, and sexual abuse. Many fled the war when NATO started its bombardments in Libya. These traumatic experiences still have an impact on their daily lives – more so than ever now that they are trapped in the limbo of camps and reception centers. "I have been in Shousha for one month. Where can I go? I cannot go back to my country and I cannot live in this desert. This is our life: we are young and stranded here, doing nothing. I must try again." MSF mental health activities in Shousha camp have revealed that most people face feelings of insecurity about the present and future, as well as anxiety and other related symptoms linked to their past. MSF staff have received testimonies about refugees and migrants in Libya being attacked, beaten, robbed, or even killed in the street. Vulnerable and helpless, many were trapped once the fighting began and had to count on others to help them flee. Some were evacuated by international organizations, but most had to resort to smugglers—once again placing their lives in the hands of others and hoping to survive the experience. Most refugees arrived at the Tunisian border with almost nothing, and some were injured or needed urgent medical care. Others were freed from detention centers in Libya at the onset of the conflict, put into trucks with no food or water, and dumped at the border with Tunisia. For those landing in Italy, uncertainty about their rights and about recognition of their status as refugees or asylum seekers in Italy is causing further suffering. So, too, is the lack of information about when they will be able to start rebuilding their lives. MSF has already underlined, on a number of occasions,11 the extreme vulnerability of refugees and migrants to violence and abuse during the ongoing war in Libya. In the absence of appropriate long-term medical and psychological treatment, and often facing months of detention, refugees and migrants are in danger of becoming even more vulnerable, which can hamper their ability to cope with poor reception conditions and to apply for asylum and legal protection. MSF calls again on the national authorities and international organizations responsible for receiving, assisting, and protecting these vulnerable people to take their long-term needs into consideration. The victims of violence, torture, and sexual violence should be rapidly recognized as such; they should be accommodated according to their needs and given access to appropriate treatment, including specialized medical care and mental healthcare. The recent traumatic experiences of those in Shousha camp have further exacerbated widespread feelings of despair. While most of those arriving in Tunisia in March initially felt relieved to have escaped Libya, they continue to face substandard living conditions, and now face fears for their security and for their future. Many are going back to Libya or attempting to cross the Mediterranean Sea to Lampedusa, Italy, ready to risk their lives again in a desperate search for a better refuge. Within plain view, traffickers smuggle people from Shousha camp across the border back to Libya. MSF teams working in Lampedusa met with several people who had passed through Shousha camp before departing for Italy. One Nigerian man had made a first attempt to reach Italy with his wife and two children on June 6. His family drowned, along with 150 others, on the journey across the Mediterranean Sea. He survived, went back to Tunisia, and finally reached Lampedusa alone on June 11. Survivors of smugglers’ boats that failed to cross the Mediterranean are also transferred to the Ras Ajdir camps, creating a backlog of people stranded in transit facilities. While MSF works to alleviate the impact of inadequate reception and living conditions in Tunisia and Italy, fighting in Libya continues to force civilians out of the country. In the meantime, as denounced by MSF in an open letter on May 19, the member States of the European Union, although engaged in this war, are tightening their border controls and strengthening detention and expulsion measures. The influx of boat people on the Italian coasts does not constitute 'illegal immigration’, but a flight toward survival, safety and protection. The 'responsibility to protect’, invoked for the military intervention in Libya, does not stop at Libya’s borders and equally applies to all civilians, including those refugees and migrants who were living, working or transiting through Libya and are direct victims of the conflict. 'Third-country nationals’ seeking refuge in Tunisia or Italy are among the most vulnerable and unseen victims of this war. MSF reminds all belligerent parties and neighboring countries of their obligation under international law of “non-refoulement” and their responsibility to keep their borders open and offer international protection to potential refugees and asylum seekers, by taking the simple measure of ensuring those fleeing Libya are not deterred from entering or remaining on their territory. Poor reception conditions and lack of protection should in no way become a ‘push factor’ to hinder refugees and asylum seekers from seeking safety. After being trapped in Libya, foreign nationals are now trapped in camps and centers, living in very precarious conditions, with no prospects for the future. After risking the journey from their home countries to seek safety and survival in Libya, this renewed uncertainty pushes them onward, to seek refuge elsewhere and even to go back to war-torn Libya, where they are among the most vulnerable in the conflict. MSF reiterates its call on the countries engaged in the war in Libya, as well as the United Nations and the European Union, to assume their responsibilities and take urgent measures to improve the reception and living conditions of all people fleeing this war and to assure their health and human dignity wherever they seek refuge. 1,104,027 according to International Organization for Migration (IOM) situation report, 20 June 2011. However, many people – most of them Libyans – have already returned to Libya. According to IOM estimate, March 2011. Migrants who crossed the border from Libya to a country that is not their country of origin. IOM and its partners have assisted 149,319 persons to return to their country of origin so far, IOM situation report, 24 June 2011. As of 19 June 2011, the United Nations High Commissioner for Refugees (UNHCR) had registered 980 recognised refugees and 1,339 asylum seekers. "Italy must drastically improve conditions facing refugees, asylum seekers and migrants fleeing North Africa, including Libya”; “Tunisia: Refugees fleeing Libya have no safe place to go”; “Open letter concerning civilians fleeing Libya for Europe”. 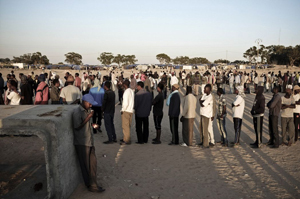 On 18 June 2011, there were 3,647 people living in Shousha camp, while 16,847 people had arrived in Italy from Libya since the beginning of the conflict. Some people have been confined in Rosolini, Sicily, since 6 May 2011 with no further action taken. European Council Directive laying down minimum standards for the reception of asylum seekers (2003/9/EC), andUN Convention on the Rights of the Child. The term ‘push back’ refers to the practice of intercepting boats carrying migrants, refugees and asylum seekers at sea and turning them back to Libya, as established in a treaty between Italy and Libya, The Treaty of Friendship, Partnership and Cooperation between the Italian Republic and Great Socialist People’s Libyan Arab Jamahiriya, signed on 30 August 2008. MSF sources cited above (footnote 6). See Memorandum of Understanding between Italy and the National Transitional Council, signed on 17 June 2011, and MSF press release (footnote 14).